I don’t understand why people go to a place like Cleethorpes for a holiday. The weather is unreliable, the sea is permanently cold and everything is expensive. Really expensive. Half an hour in the amusement arcade can take a heavy toll on the wallet, the funfair isn’t cheap, there are the pointless rides to contend with and then the donkeys. £2.50 for a five minute one hundred yard trudge up the beach hardly represents good value for money in my book. It is surely so much better to get a cheap flight to Spain, send the children to the kids’ club and sit in the sun and drink cheap San Miguel and almost certainly spend less money. I often feel an urge to walk across to point this out to people as they sit shivering behind a wind-break or sheltering under an umbrella being turned inside out by the wind, but of course I never do. 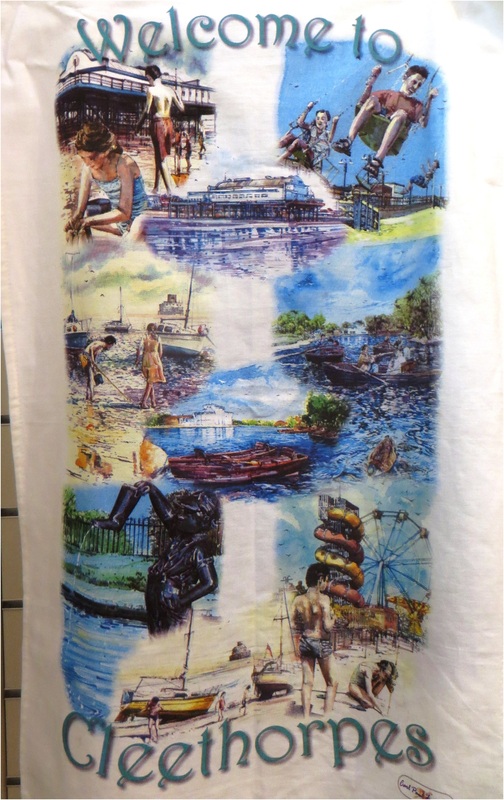 Three Trains – I Do Like To Be Beside The Seaside! 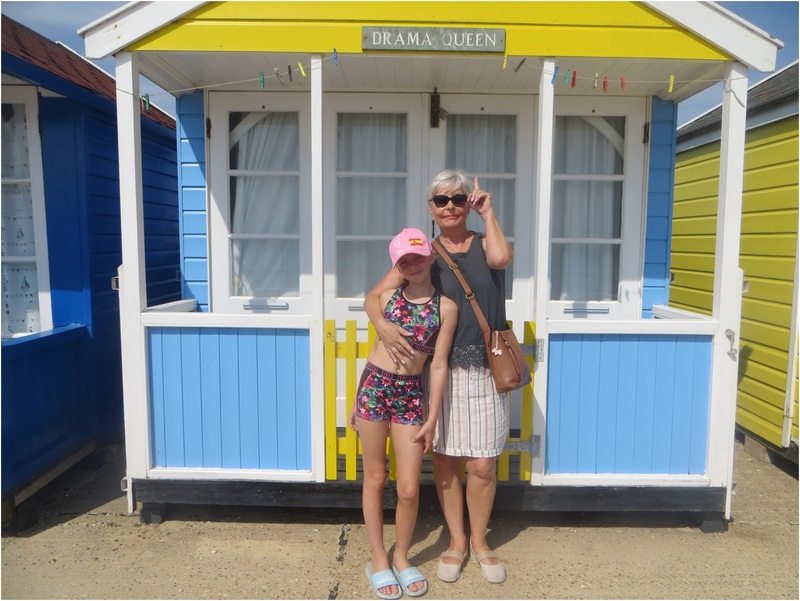 On our first day at Kessingland caravan park we squandered the time away at the swimming pool, the beach and took a short walk into the village. By day two we were ready to explore and so we set off for nearby Southwold. Southwold is ridiculously picturesque and quintessentially English, a town of Tudor houses and thatched roofs, so English that it is high on the list of filming locations for English film and television. The fictional Southwold Estate, seat of Earls of Southwold, is the country estate of the family of Lady Marjorie Bellamy in the drama Upstairs, Downstairs and the town and its vicinity has been used as the setting for numerous films and television programmes including Iris about the life of Iris Murdoch starring Dame Judy Dench, Drowning by Numbers by Peter Greenaway, Kavanagh QC starring John Thaw, East of Ipswich by Michael Palin, Little Britain with Matt Lucas and David Walliam, a 1969 version of David Copperfield and the BBC children’s series Grandpa in My Pocket. We parked the car and walked along the short seafront, a pebbled beach that is difficult to walk upon, a promenade and a row of gaily painted beach huts. Next we came to the pier. 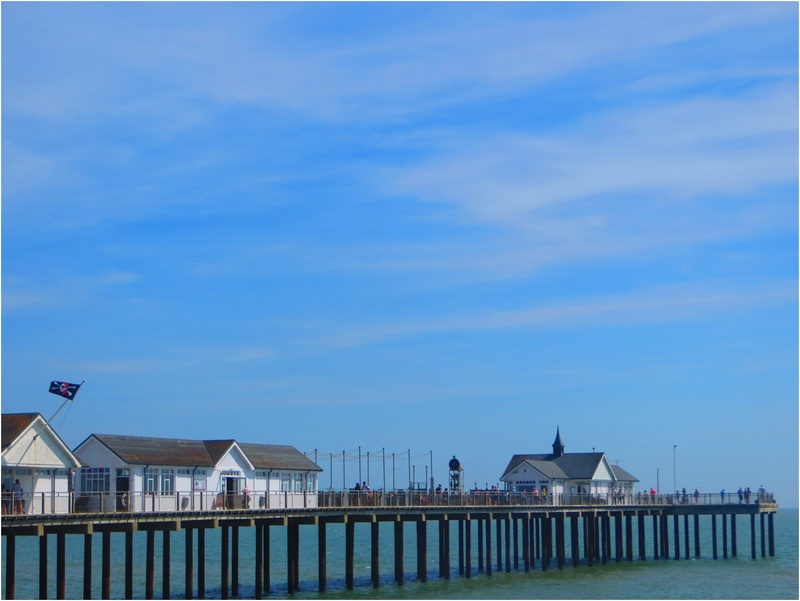 The pleasure pier is characteristically English, a genuine icon and one that I have never really understood. No one in England lives more than seventy miles* or so from the sea but when they get to the coast they have a curious compulsion to get even closer to the water and as far away from the shore as possible without taking to a boat. The Victorians especially liked piers and by time of the First-World-War there were nearly two hundred sticking out all around the coastline. If there had been satellite photography a hundred years ago then England would have looked like a giant pin-cushion. It is a very nice pier with shops and amusements all the way down to the end. 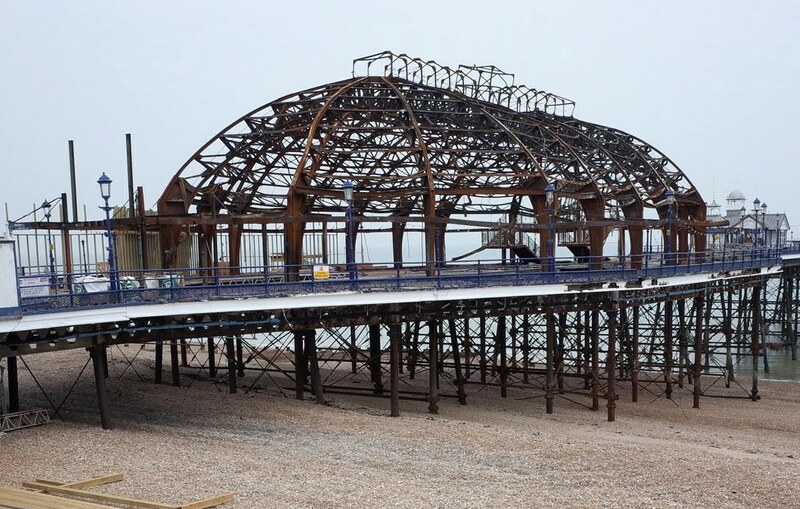 In 2002 it was voted ‘Pier of the Year’ by the UK National Piers Society, it is quite short at only just over two hundred yards, when it was built in 1900 it was seventy yards longer but it has suffered various damage over the years. English piers you see are rather fragile structures and over the years have had an alarming tendency to catch fire – Weston-Super-Mare, Brighton, Blackpool, Eastbourne, and Great Yarmouth have all suffered this fate but Southend-on-Sea is probably the most unfortunate of all because it has burned down four times which seems rather careless. The problem with a pier of course is that they are generally constructed of wood and are highly combustible and a quarter of a mile or so out to sea they are also rather inaccessible to the fire service so once they go up in flames little can be done but to watch the blazing inferno from the safety of the promenade until the fire goes out by itself and all that is left is a tangle of twisted metal girders and beams. Fire isn’t the only danger of course because the coast can be a rough old place to be in bad weather and severe storms and gales have accounted over the years for Aberystwyth, Cromer, Saltburn and Brighton. Reaching far out to sea also makes them rather vulnerable to passing ships and the aforementioned unfortunate Southend-on-Sea was sliced in half in 1986 by a tanker that had lost its navigational bearings. One unfortunate man was in the pier toilets at the time and apparently only just made it out in time before they tipped over the edge! 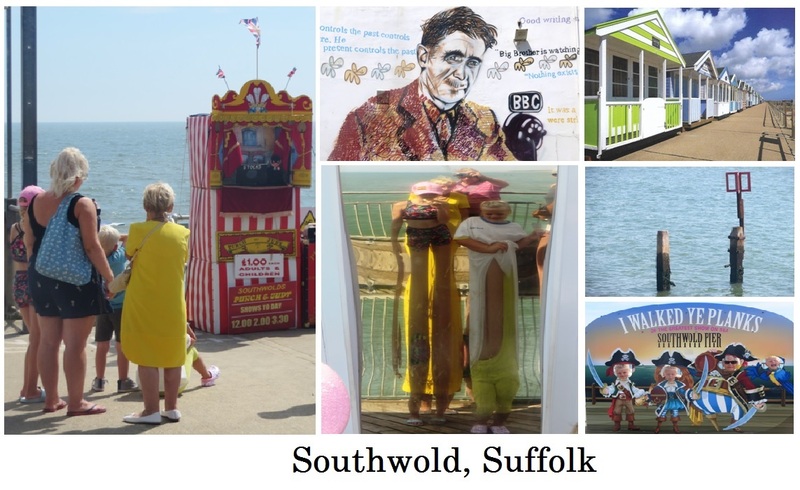 There isn’t much else to say about Southwold except that George Orwell once lived there and so after only a short stop and a drive around the busy streets we continued our drive planning to stop next at the Suffolk port town of Lowestoft. I didn’t find Lowestoft that thrilling I have to confess, it looked much like Grimsby to me where I live, a run-down sort of a place urgently in need of some investment and a make-over but there was one especially interesting place to visit while we here – Ness Point, the most easterly place in the British Isles. For such a significant place I would have expected it to be something special, a bit like Four Corners in the USA but not a bit of it. There is no visitor centre and no souvenir shop, just a windswept carpark and it is difficult to find located as it is on the edge of an industrial estate and close to a sewage treatment works and a massive wind turbine called Goliath (it was once the biggest in England). There is only a circular direction marker known as Euroscope, marking locations in other countries and how far away they are. I felt like an explorer about to set sail. The ‘Visit Lowestoft’ web site proclaims that, “No trip to Lowestoft is complete without a visit to Ness Point, the most easterly spot in the United Kingdom” As far as I could see this is about the only reason to visit Lowestoft so with nothing to detain us longer we headed directly back now to the seafront car park and enjoyed an especially good meal of fish and chips. I was reminded that a couple of years ago I was at the most Westerly point in the British Isles** on the Dingle Peninsular in Southern Ireland where we were staring out at two thousand miles of water and next stop Canada and the USA. The Blasket Islands (10°39’) at the end of the Dingle Peninsula are the most westerly point in the British Isles but these have been uninhabited since 1953, Iceland is the most westerly country in Europe and Reykjavik is the most westerly capital city (21°93’); Lisbon (9°14’) is the most westerly city on mainland Europe and furthest west than anywhere else are the Azores at 31°30. When someone tells you that something is the biggest or the longest or the highest or the heaviest it is always worth checking up I find. The most westerly point in Asia is Cape Baba in Turkey and in the United States it is Alaska which is also the most easterly as well because it stretches so far that it crosses right into the eastern hemisphere (a good pub quiz question that). ** The British Isles are an archipelago in the North Atlantic Ocean that consists of the islands of Great Britain, Ireland, the Isle of Man and over six thousand smaller isles. The term ‘British Isles’ is controversial in Ireland where there are nationalist objections to its usage and the Government of Ireland does not officially recognise the term and discourages its use. 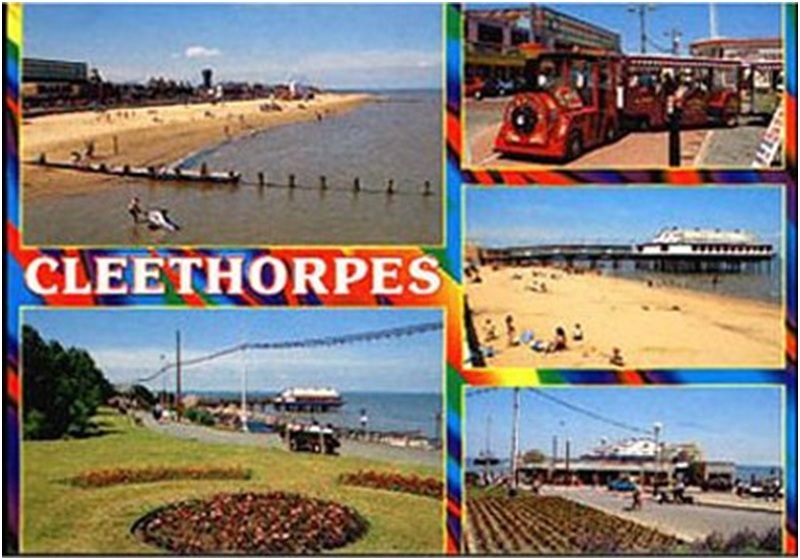 Cleethorpes is a seaside town that is attached to Grimsby like a barnacle to a rock. This is unfortunate for the residents of Cleethorpes because they consider themselves to be superior to Grimbarians in all respects and snootily resent the association with its grubby neighbour. The short train journey took only ten minutes or so as it passed through the site of old fishing docks, past the Grimsby Town Football Club ground (which is actually in Cleethorpes) and then alongside the estuary at low tide, sticky with mud before arriving at the station which really is the end of the line for this particular route. The railway terminates here but is the starting point of many seaside holidays because this is where visitors to the resort arrive from towns and cities of Humberside and South Yorkshire because while people from Leicester and Nottingham go to Skegness in the south of Lincolnshire, Cleethorpes is the seaside of choice for people from Sheffield, Doncaster and Scunthorpe. The station is situated at the western end of the promenade right in the middle of the tacky funfair and associated attractions. The sort of place that children are drawn to like bees to nectar but which I cannot wait to pass through as quickly as possible. I especially dislike those pointless children’s rides that do nothing in particular and seem to me to cost a disproportionate amount of money to the pleasure they provide. 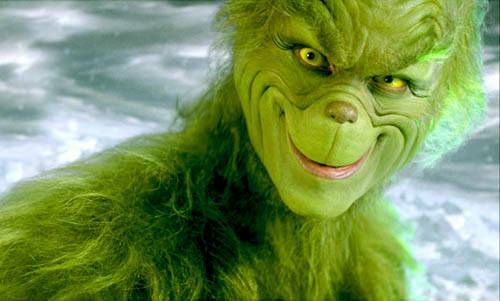 I hate them outside supermarkets and in shopping malls and if I were Prime Minister the first thing that I would do is pass a law to make them illegal. I hurried the children through this part of the visit with a promise that I would think about paying for a pointless ride on the way back later. Next we came to the pier. 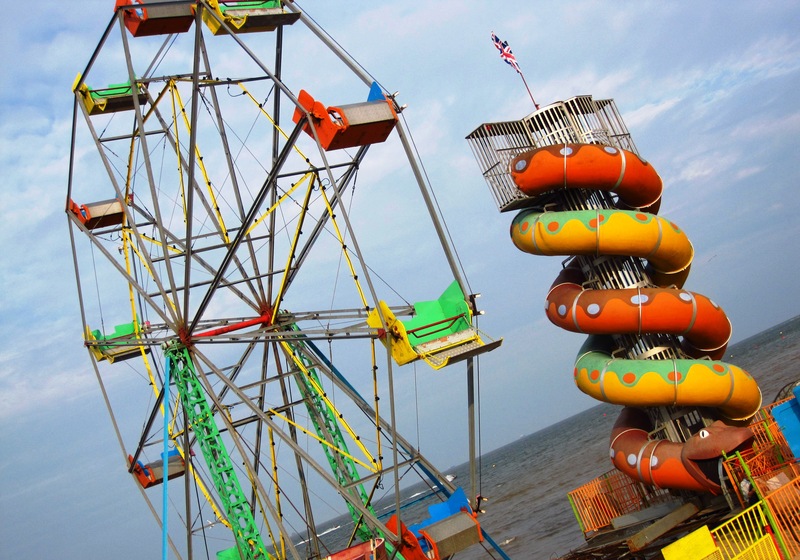 The pleasure pier is quintessentially British, a genuine icon and one that I have never really understood. No one in England lives more than seventy miles* or so from the sea but when they get to the coast they have a curious compulsion to get even closer to the water and as far away from the shore as possible without taking to a boat. The Victorians especially liked piers and by time of the First-World-War there were nearly two hundred sticking out all around the coastline as though the country was a giant pin-cushion. Cleethorpes Pier now claims to be the site of the ‘Biggest Fish and Chip Shop’ in the World but I take that boast with a pinch of salt! The shortest pier in England is that at Burnham-on-Sea in Somerset (so they claim) but this one must be a true contender for the title. It was opened in 1873 (financed by the Manchester, Sheffield and Lincolnshire Railway) and was originally nearly a quarter of a mile long but over its lifetime it has been severely shortened. Fire isn’t the only danger of course because the coast can be a rough old place to be in bad weather and severe storms and gales have accounted over the years for Aberystwyth, Cromer, Saltburn, Southwold and Brighton. Reaching far out to sea also makes them rather vulnerable to passing ships and the aforementioned unfortunate Southend-on-Sea was sliced in half in 1986 by a tanker that had lost its navigational bearings. One unfortunate man was in the pier toilets at the time and only just made it out in time before they tipped over the edge! Cleethorpes pier is no exception to disaster and it burnt down in 1905. It was rebuilt but was shortened again in 1940 and this is my favourite Cleethorpes Pier anecdote. It was demolished to prevent it being of any use to the German army in the event of an invasion of England via the Humber estuary. Quite honestly I don’t understand why the German army would need the pier to offload their tanks and equipment when they could simply have driven it up the muddy beach but that is not the point of my story. 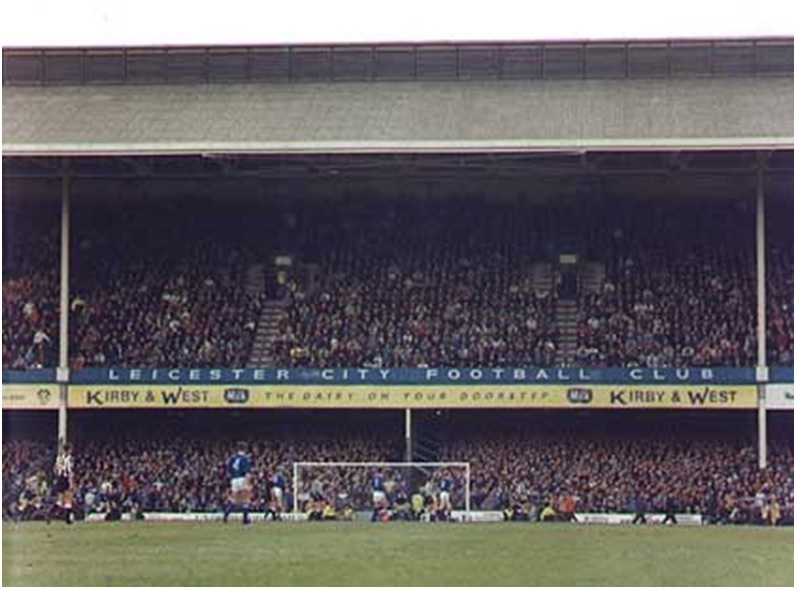 The dismantled iron sections were sold after the war and they were bought by Leicester City Football Club who used them in the construction of the main stand at their ground at Filbert Street. 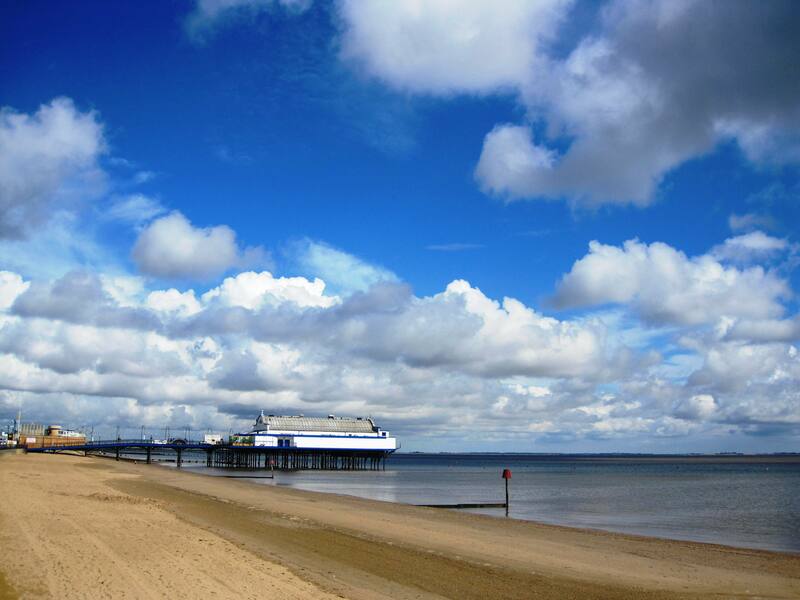 From about the age of ten my dad used to take me to watch Leicester City and we used to sit in that stand every home match and so although I didn’t know it I had actually been on Cleethorpes pier fifty years before I ever visited the place. * Based on a direct line drawn on an Ordnance Survey map from location to the first coast with tidal water. The village that is further from the sea than any other human settlement in the UK is Coton in the Elms in Derbyshire at exactly seventy miles in all directions. At the entrance to the pier we waited at the appointed place for the tourist train to arrive and take us the mile or so to the far end of the promenade. Next to cruising, the second holiday form of holiday transport that I hate most of all are those annoying tourist trains which are now an irritating feature of almost everywhere you go. I once vowed never to go on one but now I have to eat my words and make concessions to my grandchildren. The road train arrived and made slow progress along the ‘shared space’ road/pavement at the back of the beach. 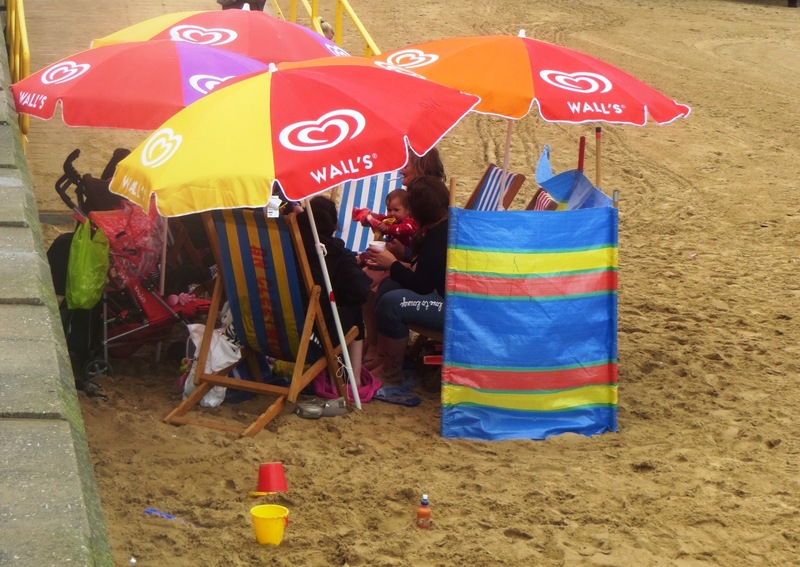 It was a typical English summer day at the seaside – overcast and a little cool with the sea about a mile away at low tide and only visible through a powerful pair of binoculars but there were some hardy people toughing it out and resolutely determined to spend a day on the beach. 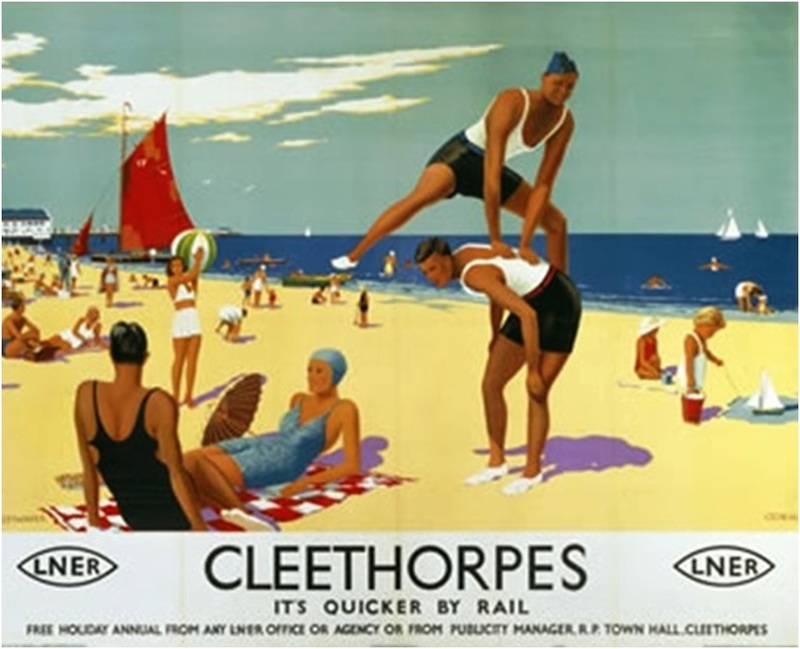 Railway posters of the 1920’s show pictures of fit healthy young people playing beach games on golden sand next to an inviting azure sea where sailing dingies float gently by all under a blue sky and blazing sun without a body piercing or an unsightly tattoo in sight but it is rarely like that now, if indeed it ever was. It is surely so much better to get a cheap flight to Spain, send the children to the kids’ club and sit in the sun and drink cheap San Miguel and probably spend less money. I often feel an urge to walk across to point this out to people as they sit shivering behind a wind-break or sheltering under an umbrella being turned inside out by the wind but of course I never do. The final stop was at the narrow gauge railway terminus where I purchased tickets to board the train which was already waiting at the platform and we squeezed ourselves into tiny carriages being pulled by a wheezy engine belching smoke that was preparing to depart for its lazy two mile journey along the sea front. Railways in Britain are a national obsession. When the Victorians weren’t building piers they were building railways. And by the time that they were nationalised in 1948 there were simply too many of them to be economical. So in the 1960’s, based on a document called the ‘Beeching Report’, the Government set about a reform programme which resulted in thousands of miles of track being dismantled and hundreds of stations being closed. Enthusiasts will go to great lengths to build and preserve railways. The Cleethorpes Coast Light Railway was constructed from track and stock salvaged from the potato fields of the county where they were once used to transport tubers from the fields to the packing sheds at harvest time. I like narrow gauge railways and steam engines and the Cleethorpes Coast Light Railway is an agreeable little ride that sweeps past the boating lake, the paddling pool, the civic gardens and the dilapidated wooden huts which stand at the back of the beach as reminders of a bygone seaside age. At the eastern terminus we stayed on board as the engine switched ends and then made the return journey back to the promenade where we stopped for ice cream and slush puppies. My grandson loved the trains and when it was time to go back to the station I offered a return journey on the road train. With the wisdom of a two year old and without any hesitation he corrected me and said – “That’s not a train granddad, it’s a bus”. How smart is that! Back at the pier I was now faced with dealing with my rash promise to think about a pointless ride. I resisted. The children staged a rebellion and climbed into a Postman Pat van and pushed the buttons and it magically sparked into life. The ride over they pushed the buttons again and it worked a second time. These pointless rides are usually 50p a go or three rides for £1 so someone had been daft enough to put £1 in the slot and only take one ride. A win/win situation I thought and congratulated myself, they got the ride and I didn’t waste any money. My eldest asked if they could go on another and I said no they had been on one and that was enough (that is mean I agree) she said that she understood that but pointed out – “yes, but you didn’t have to pay for it granddad”. How smart is that! Admitting defeat I paid for a pointless ride and then we went back to the station and caught the Trans Pennine Express back to Grimsby to find a fish and chip shop for a tea-time treat. They know a thing or two about chips in Grimsby let me tell you and there is a chip shop in every street – sometimes two and people there know best how to cook them and to eat them. The reason there are so many is that Grimsby was once the biggest fishing port in the World, everyone had fish and housewives used to take their fillets to a chip shop to have it cooked for a penny. There isn’t a great deal to do at Grimsby railway station whilst waiting for a train to arrive except keep the children from the edge of the platform, there is no book shop and the modest café is almost permanently closed so we waited as patiently as we could until the purple liveried train finally arrived, climbed on board and set off for nearby Cleethorpes. The short train journey took only ten minutes or so as it passed through the site of old fishing docks, past the Grimsby Town Football Club ground (which is actually in Cleethorpes) and then alongside the muddy estuary before arriving at the station which really is the end of the line for this particular route. Cleethorpes pier is no exception to disaster and it burnt down in 1905. It was rebuilt but was shortened again in 1940 and this is my favourite Cleethorpes Pier story. It was demolished to prevent it being of any use to the German army in the event of an invasion of England via the Humber estuary. Quite honestly I don’t understand why the German army would need the pier to offload their tanks and equipment when they could simply have driven it up the muddy beach but that is not the point of my story. 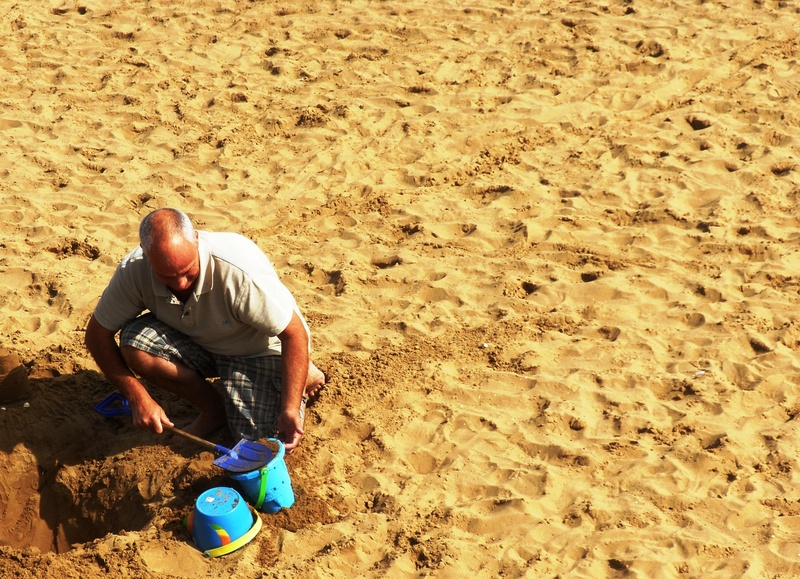 Since July 2011 I have lived in the east coast town of Grimsby and every so often I get to entertain my grandchildren for a few days at a time. This can be a challenge because to be honest there isn’t a great deal to do in Grimsby. 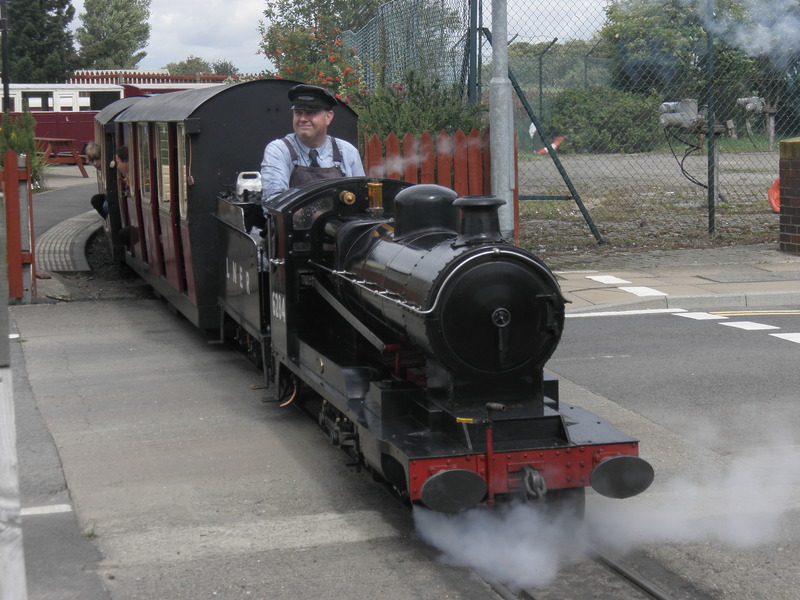 My grandson likes trains so one day last year I planned a three train treat, a main line ride from Grimsby to Cleethorpes, a promenade sightseeing trip and a ride on a narrow gauge steam train. I like Grimsby but it has to be said that it is an odd place. I am not sure what Bill Bryson was expecting to find, Chichester or Banbury perhaps? Grimsby is a town in decline. 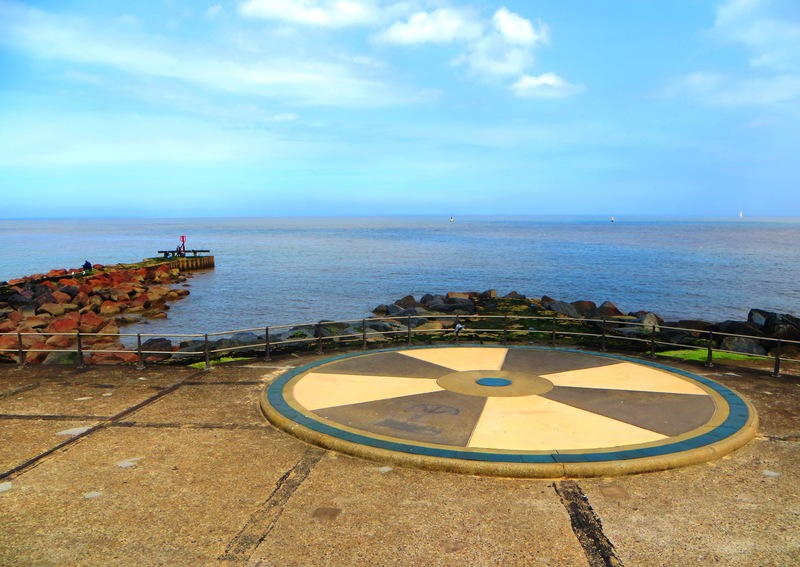 On the south bank of the Humber Estuary it is so far east that the only place to go after this is the North Sea and there aren’t any ferries to Europe as there are in Hull on the north side of the river. It is a dead end. It is a place that you only go to by choice. 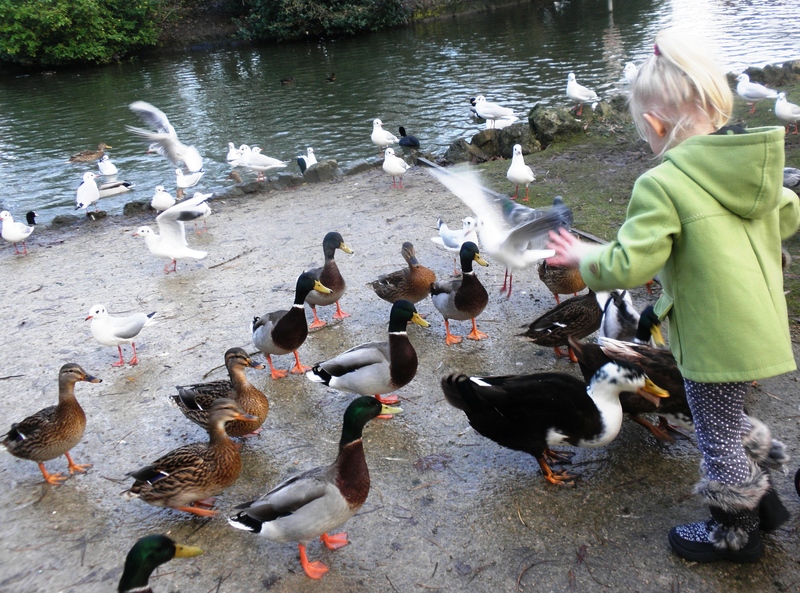 No one visits Grimsby by accident. 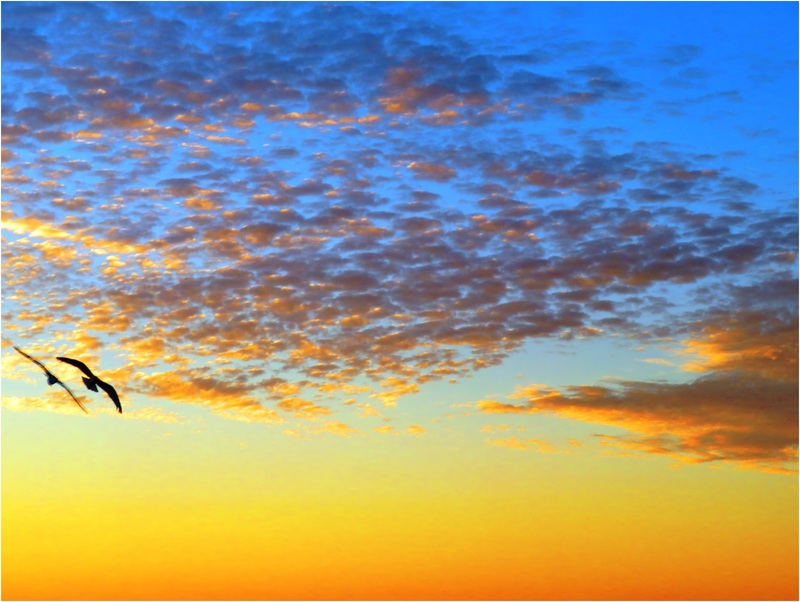 You cannot stumble upon it while taking a leisurely drive along the coast as say in Northumberland or East Anglia. It can never be an unexpected discovery. A postcard map of Lincolnshire doesn’t even show Grimsby even though it is the second largest city/town in the county after Lincoln. It doesn’t get any visitors unless they are on business and, believe me they, don’t really want to go there and it doesn’t get any tourists. I mean it doesn’t get any tourists! As a measure of this let me tell you it is completely impossible to buy a post card of Grimsby anywhere in the town. There is nothing in Grimsby that anyone would want a post card of. I challenge anyone to find a reference to Grimsby in any visitor guide to England! My day out started at the railway station which is an area close to the old Market Square. By all accounts this was once an attractive part of the town with a traditional market place surrounded by Georgian houses and old-fashioned traditional family shops. The sort of place that we remember fondly in a foggy mist of 1950s nostalgia, and then in the 1960s the modernist architects and town planners did their worst and demolished it all to make way for Soviet style concrete construction of modern shops, a hotel, offices, banks and a gloomy underpass and today, except for a good statue that pays tribute to the fishermen of Grimsby, it is a place without heart or soul. On any average day here you will find unemployed men drinking from about nine o’clock in the morning (unemployment in Grimsby is 50% higher than the national average), teenage girls pushing their babies in push chairs (Grimsby has the third highest rate of teenage pregnancies in the UK) and unemployable young men in hoodies and track suit bottoms or if not track suit bottoms then jeans slung low around the hips to show off a fake designer label band on their underpants. With nothing really useful to do most of the young people in the Market Place are reduced to making important decisions like which part of the body to have pierced or tattooed. Personally I cannot understand why anyone (unless they are a Maori) would want to disfigure themselves in this way but in Grimsby and all across the UK bodies are decorated with lions, wolves and dragons, goblins, fairies and skulls, a comprehensive A to Z of boys’ and girls’ names and more Indian braves than General George Armstrong Custer had to stand against at the Battle of the Little Big Horn! Recently I went to have a haircut and waiting in front of me was a woman with a low cut top and tattooed writing all over her voluminous breasts. She was a big woman (Grimsby has an adult obesity rate of over 30%) and although I was too embarrassed to make a close inspection I suspect it might have been the complete works of William Shakespeare with space left over for Tolstoy’s ‘War and Peace’. In between the new Market Place, with pointless pavement water fountains, where rag-arsed kids who are playing truant from school dodge the water jets, and the railway station there is a new street layout called ‘shared space’ which is a crazy paved area where neither traffic or pedestrians have any sort of priority. It is the mad idea of an English urban planner called Ben Hamilton-Baillie who proposes that road/pavement planning should be based on what he calls behavioural psychology. Apparently he bases this theory on the basis that he has visited Utrecht in the Netherlands and it works there. The point that he seems to have overlooked is that Utrecht is a pedestrianised traffic free city centre. England it seems has a talent for producing a long line of barmy architects. It doesn’t come as a great surprise that it doesn’t work of course and despite paying this man a king’s ransom the local council had to eventually climb down, reinstate pedestrian crossings and proper pavements because no one in Grimsby was ready for a space age solution to the traffic problems of the modern town. After visiting a cash machine at the Halifax Building Society we walked the hundred yards or so to the train station, bought our tickets and went to the platform to catch our train which was due in five minutes time. We were waiting for a Class 158 Desiro Trans Pennine Express but there was nothing express about it this morning because the information board advised us that it was approximately twenty minutes late which shouldn’t have been a great surprise because according to its own website Trans Pennine Express only ever achieves about 85% reliability on providing services at the scheduled time.